In this Learning Docker training course, expert author Rick Fast will teach you how to create, deploy, and manage Docker images and containers. This course is designed for the absolute beginner, meaning no previous experience with Docker is required. You will start by learning about Docker containers, including how to run containers, how to run and configure containerized applications, and how to debug containers. From there, Rick will teach you about Docker images, including images on Docker Hub and web application images. 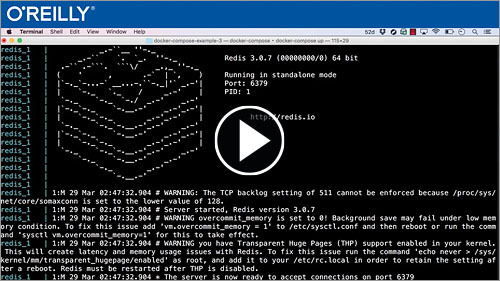 This video tutorial also covers networking, volumes, and Docker Compose. Finally, you will learn about Docker extras, such as Docker Swarm, Kitematic, and overlay networks. Once you have completed this computer based training course, you will have learned how to create, deploy, and manage Docker images and containers. Working files are included, allowing you to follow along with the author throughout the lessons.